These dark chocolate dessert cups are sinfully delicious. With a middle layer of fresh raspberries, and a sweet raspberry glaze on top, these brownies prove that chocolate and raspberries are a match made in heaven. Heat butter and chocolate in a microwave, covered, until butter melts, 1–2 minutes; let stand until chocolate is soft, 1 minute, then whisk until blended. Whisk in flour, brown sugar, water, espresso powder, and salt. 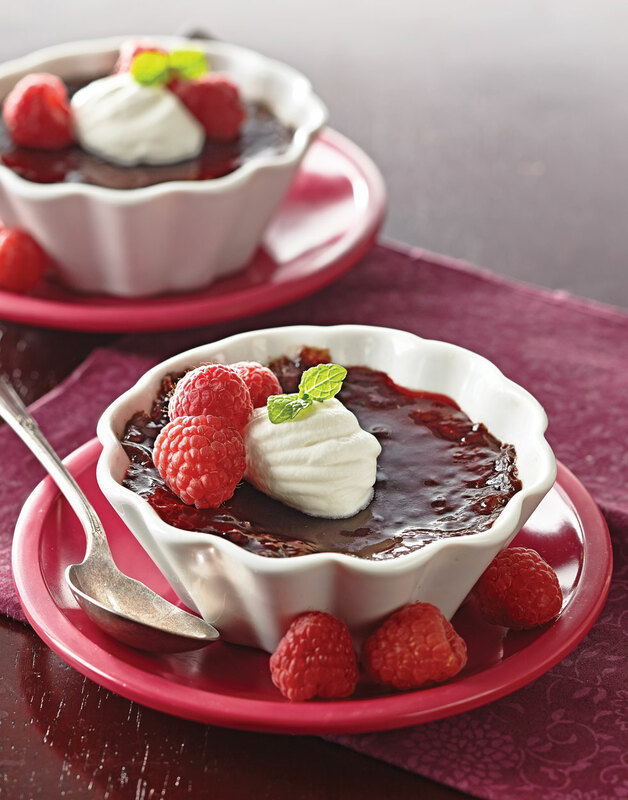 Pour 1/4 cup batter into two 1-cup microwave-safe dishes; top each with 2 Tbsp. fresh raspberries, then the remaining batter. Microwave brownies until a toothpick inserted into centers comes out with only a few small crumbs, about 4 minutes (or 2 minutes if cooking one at a time). Top each brownie with 1 Tbsp. melted jam; let cool until jam sets, about 10 minutes. Serve brownies with whipped cream and additional raspberries. So the chocolate doesn’t scorch, let the residual heat of the butter soften and melt the chocolate. Adding a little espresso powder intensifies the chocolate flavor of these brownies. For freshness, add a layer of whole raspberries in the middle of the brownie cups.